I for one have been in 2014 planning mode for awhile now. Both long and short term goals are swirling around my head. From personal to professional there are a myriad of goals I have set for myself and a new year is the ideal time to begin working on them. I worked three part time jobs and had landed a few merit scholarships to cover my College Tuition. It wasn't easy, but I know the sacrifices I made to pursue to my degree were very much worth it. Post College was a whirlwind of work and I shelved my Master's Degree dream because I was on a career path that kept me very busy. I want to go back. I want to pursue a Master's, and I'm sure I'm not alone. I'm probably busier now then I was right after College, but despite having way more on my plate, I am not going to let anything, including this lousy economy stand in my way. I have never let any obstacle stand in the way of something I really want for myself. Ƹ̵̡Ӝ̵̨̄Ʒ - Choose a Degree that is PROFITABLE - Adults have less time to experiment and knowing which Degree is 'profitable' in the long run is going to be half the battle won! Ƹ̵̡Ӝ̵̨̄Ʒ - STEM initiatives (acronym for Science, Technology, Engineering and Mathematics) are not just for younger students! Educations focusing on the Technical and Scientific Fields are actually a bit easier to find Scholarships for. I am NOT saying it will be easy to land them, but there is a bigger need especially for women in these fields and there are scholarships out there geared to students who wish to pursue a scientific or technical career! Ƹ̵̡Ӝ̵̨̄Ʒ - Exhaust all options as 2013 acceptance rates showed heightened School Selectivity. It's even harder for Adult returning students to compete for those Golden Acceptance Letters, you need to be creative and exhaust as many options as possible. Ƹ̵̡Ӝ̵̨̄Ʒ - Consider Distance Learning. Who said the only way to get a Degree is to attend an actual campus? Your dining room table can be your study hall, with a Distance Learning Degree, College comes to YOU on your schedule whenever, wherever. Ƹ̵̡Ӝ̵̨̄Ʒ - Start with what you already know - Sit with a counselor or academic advisor to find out how your real world experience may translate into credits toward your degree. Your experience and maturity is actually an ADVANTAGE not a dis-advantage! Exhausting every possible option for funding is just plain smart! How about the chance to win $10K to return to school? Ƹ̵̡Ӝ̵̨̄Ʒ - No Essay to complete! Ƹ̵̡Ӝ̵̨̄Ʒ - No GPA Score Required to Participate! Ƹ̵̡Ӝ̵̨̄Ʒ - Short Registration Form! Ƹ̵̡Ӝ̵̨̄Ʒ - $10,000 to put toward the start of your DREAMS! Instead of asking Why? Ask Why Not? As a Career and Life Coach I can tell you that a Degree is a must! Hiring Managers in this economy can be way more selective, and if you don't have a degree (as a former recruiter) I can tell you a hiring manager is going to lean toward the candidate who has that Degree! 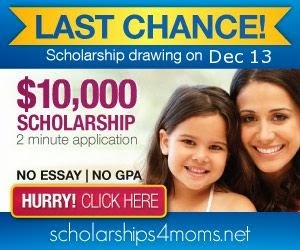 FTC Disclosure: This is a compensated campaign brought to you by Scholarships 4 Moms and Mom Bloggers Club. All opinions are 100% my own. I am disclosing this in accordance with the Federal Trade Commission 16 CFR, Part 255 - Guides Concerning the use of endorsements and testimonials in advertising, you may visit our full giveaway and disclosure page for complete policy information.